WHAT TO DO WITH RESIDUE: To keep crop residue from building up too much on the field surface, some farmers bury it with tillage or apply nitrogen to try to increase decomposition of residue. But that can be counter-productive from an economic and environmental standpoint, says ISU agronomist Mahdi Al-Kaisi. Iowa State study shows using tillage or applying N to increase breakdown of crop residue has significant drawbacks. After several years of big corn yields and increased production of cornstalks, especially if you are using a no-till system, crop residue can build up on the field surface to such an extent that it's hard to handle. Large amounts of residue are difficult to slice through and do a good job of putting seed in the ground with a planter. What can you do to get crop residue to decompose faster? To keep crop residue amounts from becoming unmanageable, farmers want to speed up the breakdown of the residue. Some use tillage or apply nitrogen to the surface crop residue try to increase decomposition. But this can be counter-productive from both an economic and an environmental perspective, says Iowa State University Extension agronomist Mahdi Al-Kaisi. He specializes in soil management. Crop residue serves an important role in physically protecting soil by preventing soil erosion during rain events or high winds, he notes. Also, crop residue plays a significant role in enhancing the soil biological community by providing sources of organic carbon and nitrogen for its energy or food needs. "To understand how residue decomposes or breaks down, you need to understand the processes and mechanisms that include both biological and chemical activities influenced by environmental and soil conditions, namely air and soil temperatures, soil moisture availability, soil pH, oxygen and type of microbial community," says Al-Kaisi. In the following article, Al-Kaisi explains what goes on and what you can do to help manage crop residue better to get the full conservation and yield benefits from it. The composition of crop residue includes lignin, cellulose, hemicellulose, and macro and micro nutrients. To release or breakdown and decompose most of these organic forms, certain biological and enzymatic processes controlled by a wide range of microorganisms influenced by other factors have to occur to these materials at various rates as influenced by the environment and soil conditions. Recently, ISU conducted a study to examine the effect of three different tillage systems that include deep tillage (DT), strip-tillage (ST) and no-till (NT) on residue breakdown of both Bt and non-Bt corn residues. 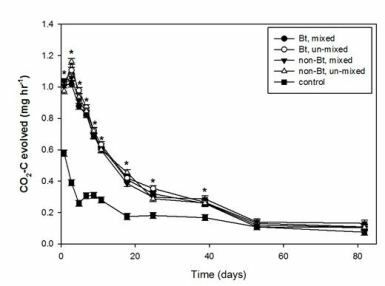 The results of this three-year field and laboratory incubation study show no signi?cant differences in the breakdown or percent of residue that remained among the three tillage systems of Bt and non-Bt corn hybrid decomposition. Also, in these studies after 12 months, there was no difference between tillage systems or Bt and non-Bt residue hybrids breakdown in the ?eld, where 34% to 49% of the corn residue still remained on the soil surface. The results of the residue decomposition study are presented in Figure 1, in which the residue decomposition rate is represented by CO2-C release. The results show no significant difference in the breakdown or decomposition due to tillage or type of residue (Bt or non-Bt). The results of corn residue decomposition with different N rates in the no-tillage system under field conditions are presented in Figure 2a of the two-year study. Corn residue decomposition was evaluated by applying three N rates (UAN 32% N) of zero, 30 and 60 pounds N per acre to corn residue immediately after harvest, in which specific amounts of corn residue were weighed and placed in nylon mesh bags and left in the field immediately after harvest for decomposition evaluation. The rate of residue decomposition was evaluated every three months for the entire year (12 months). Fig. 2. Nitrogen (N) effect on (a) residue breakdown in the field, (b) residue breakdown in the laboratory under 32 degrees F and (c) residue breakdown in the laboratory at 90 degrees F room temperatures. The results showed that corn residue decomposition increased with time with lesser amounts of residue remaining after each evaluation period. 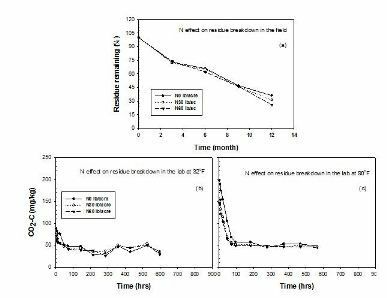 There were no differences in the rate of residue decomposition as a result of N application of different N rates. These results show that applying N fertilizer to facilitate residue decomposition is not effective. The timing of N application for corn residue decomposition immediately after harvest, as practiced, is not an effective strategy, as the soil and air temperatures decrease over time after fall harvest. The decomposition of crop residue is highly controlled by soil moisture and temperature as essential factors for microbial activity for the residue decomposition. Therefore, from economic and environmental perspectives, N application has little effect in achieving the intended results of facilitating residue decomposition. The same results were observed with laboratory evaluation of corn residue decomposition that was conducted with the same residue treated with different N rates in the field study. Corn residue samples from the field were incubated in the laboratory under constant temperatures of 32 degrees F and 90 degrees F for approximately 30 days each (Fig. 2b and 2c). The rate of corn residue decomposition under laboratory conditions followed a similar trend as that in the field. Similar to the results of the field study, no differences in residue decomposition or breakdown with different N rates were found. The laboratory study results confirmed the field results and demonstrated the role of temperature in controlling corn residue decomposition rather than N rate, in which a slower rate of residue decomposition was observed at the low temperature (32 degrees F) and increased at the higher temperature (90 degrees F) (Fig. 2b and 2c) without any effect of N application on residue breakdown. Summary: "The use of tillage or N application to increase residue decomposition can be counterproductive from economic and environmental perspectives," says Al-Kaisi. "From an economic perspective, both options of management can add additional cost to the management input in terms of materials, time, labor, fuel, and equipment costs. Environmentally, both tillage and N application are not very sustainable practices; tillage can contribute to soil health and water quality deterioration by increasing soil erosion potential, sediment loss and water quality degradation, as do N applications, where no growing plant can use it." He adds, "Our research and many other studies do not support such practices regardless of the justification or claims that propose tillage equipment can manage residue. Disturbing the soil does not constitute an improvement in soil quality nor increase in residue decomposition. Residue decomposition is controlled by biological processes that are influenced by environmental and soil conditions."